« Burnaby ALDYNNE on the Park Condo High-Rise by Polygon > Live next to a 222 Acre Central Park Location with Superior Architecture & Features! Now selling! The new Prima Residences in Port Coquitlam is centrally located close to everything in the Lower Mainland. You can get to downtown Vancouver in 34 minutes or less via the West Coast Express and with the upcoming Evergreen SkyTrain Line, accessing the rest of the Greater Vancouver region will be quick and easy. Situated at 110 – 2255 Wilson Avenue Port Coquitlam, the new Prima Residences are open daily from noon to 5pm at this spectacular sales office. The affordable price point of these luxurious new residences at Prima Port Coquitlam will be priced from just $219,900 for a junior 2 bedroom suite. There are only twenty five available homes in this smaller boutique development that features oversized glass windows framing mountain views, spacious floor plans, and modern West Coast architecture with horizontal cedar and fibre board lap siding accents, metal cladding and chic decorative slats. The beautiful, luxe and urbane nature of the new Port Coquitlam Prima Residences also features a close proximity to the PoCo trail network, top ranked restaurants, shopping options and great schools. The floor plans at Prima Port Coquitlam condos will range between 751 and 854 square feet with 1 bedroom plus den to two bed plus den and 2 full bathroom layouts available. The main living areas will have overheight 9 foot ceilings and luxurious detailed finishes include quartz stone counters, frameless glass showers with rain shower heads and beautiful kitchen appliances including high end fridge with water and ice, and Kohler hardware. Also, the homes will have premium real engineered hardwood and full size washer and dryer. 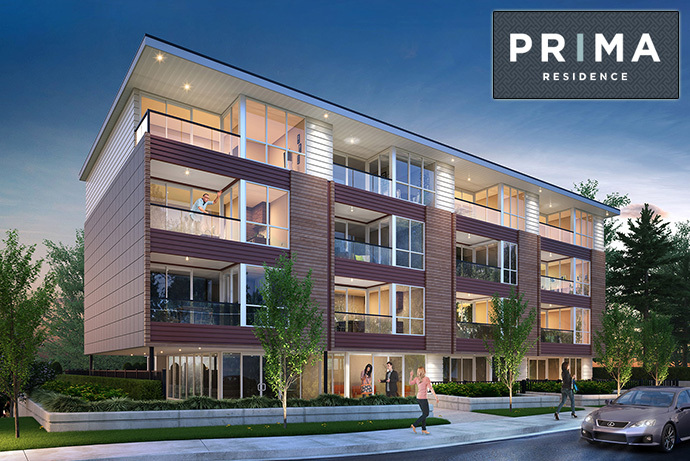 For more information about the new Prima Residences in Port Coquitlam please register your interest online at www.primaliving.ca today. Port Coquitlam is the perfect balance of peaceful outdoors and the upbeat urban lifestyle that home buyers are looking for. From the Traboulay PoCo Trail to Gates Park and numerous other community outdoor recreational spaces, this is the place to live for health individuals and families. PRIMA Port Coquitlam condos are just a short walk away from the downtown core which features tonnes of shopping, dining and services. As well, Coquitlam Shopping Centre is very close by. There are security cameras in the underground parking and entrance lobby in addition to access controlled parkade entry. All homes at the new PRIMA Port Coquitlam condo building will come with the comprehensive third party 2-5-10 Home Warranty protection plan. The project is brought to you by APOLLA Development. West Coast modern architecture and interior living spaces are offered here at the new Port Coquitlam PRIMA condo residences. Unmatched luxury features and high-end finishes in addition to excellent construction and service will make the Port Coquitlam PRIMA condos a best seller in the Tri-Cities in the Lower Mainland. There is a resident amenities room on site and 2 designer selected interior colour palettes for presale homebuyers to choose from. The homes at the PoCo PRIMA condo residences will have nine foot over height ceilings in addition to beautiful engineered hardwood floors. All homes will come with a convenient top loading washer and dryer by Whirlpool in addition to two inch Venetian blinds. The ensuite bathrooms will feature frameless glass showers (walk-in) with glass door and rain shower head fixture in addition to temperature controlled technology that permits the home owners to pre-set high temperature stop. In addition, the sleek bathrooms at the Port Coquitlam PRIMA condos will feature oversized deep soaker tubs, Kohler sink and faucet in addition to under cabinetry strip lighting and polished mirror with medicine cabinet storage and adjustable shelving units. The bathrooms will also feature beautiful tile work from floor to ceiling for the shower and tub surrounds. The high end gourmet kitchens at the new PoCo PRIMA condos will feature KitchenAid Architect Series appliances in addition to a kitchen island and quartz stone counters with polished porcelain wall tiled backsplash. The cabinets will have soft closing drawers and there is a KitchenAid microwave with hood fan combo unit in addition to an ultra quiet KitchenAid stainless steel dishwasher. Other amazing kitchen features at the boutique PRIMA Port Coquitlam condos include a Kohler Sterling Carthage under mount double bowl sink in stainless steel in addition to a pull out faucet by Kohler Purist. As well, the stainless steel sink will have Silent Shield system, a sound absorbing technology which is quiet unique.